Interview Tips and First Impressions. At Zanes Law, we strive to provide the best, most up-to-date information and resources to both our clients, non-clients and the community as a whole. We believe that if you are well prepared for an interview with us, then you will be well prepared for an interview anywhere! We also want an interview at our firm to be enjoyable for both parties and as much as we don’t like to admit, first impressions for both of us are important! When you are asked to introduce yourself or “tell us a little bit about yourself” you’ll have it nailed down and authentic! This will definitely break the ice and build confidence for you as the interviewee and will make a great impression on your interviewer who is looking for confidence in any employee. So what’s the best strategy to accomplish the above? Keep your introduction positive and simple. Don’t ramble on for too long. 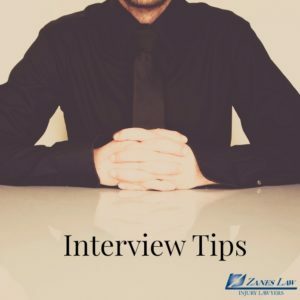 For instance, highlight aspects of your career, interests, accomplishments, education, and / or hobbies that match that of the company and interviewer. Focus on what is directly relevant to the job you are interviewing for and for the person interviewing you. Keep in mind an interview is generally not about how smart you are, or how great of a person you are. It is about your fit for a specific job. Most interviewers don’t have long attention spans, so use this time wisely. Don’t assume that your interviewer has read your resume. However, don’t simply recite your resume verbatim to your interviewer. Sadly, many interviewers are not that well prepared, and don’t let that sidetrack you. Also, keep in mind who is interviewing you. If it’s an introductory HR interview, keep things high-level. Even if you are interviewing for a highly technical job, chances are the recruiter will leave that part of the interviewing process to the subject matter expert. Remember this is your time to craft your message, so don’t bring up anything negative! Even if you are reaching for the job, give an introduction that shows why you deserve it. Never talk yourself out of a job or hedge in the first few minutes. If you are a recent college graduate, highlight internships, hobbies, or college projects that relate to the job. If you are making a career switch, highlight your positive attributes and transferable skills. If you are looking to make the move to management, highlight specific examples of how you have motivated and led teams. If you have been referred to the company by a current employee, it is appropriate to mention that they got you excited about the position. Also, if you know anyone else at the company, and feel that they will give you a positive recommendation, let the interviewer know. Finally, if you are feeling uncomfortable and having a hard time reading what the interviewer wants, it’s fair to ask them! For instance, say something along the lines of: “I have 10 years of work experience, and want to make sure I best answer your questions. *Thank you to Inc. Magazine & Quora (where the original information was published) for sharing such awesome tips!